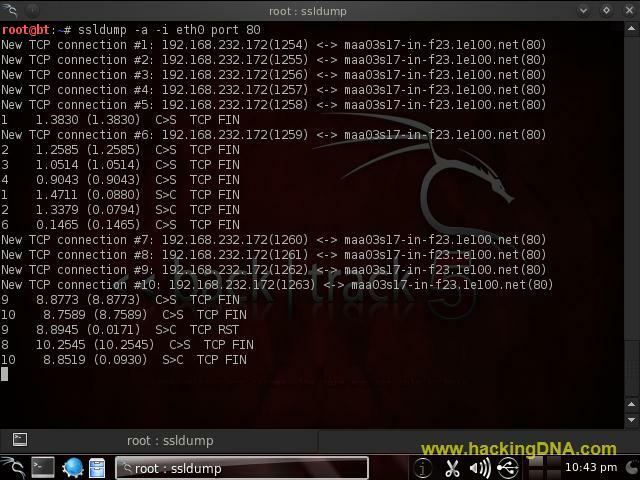 ssldump is an SSL/TLS network protocol analyzer. It identifies TCP connections on the chosen network interface and attempts to interpret them as SSL/TLS traffic. When it identifies SSL/TLS traffic, it decodes the records and displays them in a textual form to stdout. If provided with the appropriate keying material, it will also decrypt the connections and display the application data traffic. The host which send the first SYN is printed on the left and the host which responded is printed on the right. Ordinarily, this means that the SSL client will be printed on the left with the SSL server on the right. In this case we have a connection from 192.168.232.172(port 1232) to maa03s17-in-f24.le100.net(port 80). To allow the user to disentangle traffic from different connections, each connection is numbered. This is connection 2. The next field in the record line is the direction that the record was going. C>S indicates records transmitted from client to server and S>C indicates records transmitted from server to client. ssldump assumes that the host to transmit the first SYN is the SSL client (this is nearly always correct. Alert - type and level (if obtainable)Fuller decoding of the various records can be obtained by using the -A , -d , -k and -p flags. To use ssldump , we have to follow all the options associated to ssldump ,as we are now going to use . First we simlply run the ' ssldump ' on my interface(eth0) to check is it working or not , then afterwards we implement other options it . When some one on the interface opens any website on port 80(http), ssldump captures traffic. Display the application data traffic. This usually means decrypting it, but when -d is used ssldump will also decode application data traffic before the SSL session initiates. This allows you to see HTTPS CONNECT behavior as well as SMTP STARTTLS. As a side effect, since ssldump can't tell whether plaintext is traffic before the initiation of an SSL connection or just a regular TCP connection, this allows you to use ssldump to sniff any TCP connection. ssldump will automatically detect ASCII data and display it directly to the screen. non-ASCII data is displayed as hex dumps. Print absolute timestamps instead of relative timestamps.